Our Bentley offers a style of motoring which is rarely available in today’s world – guaranteed to make any Bride feel special on her wedding day. Bentley motor cars have been handcrafted at their manufacturing plant in England for over 90 years. 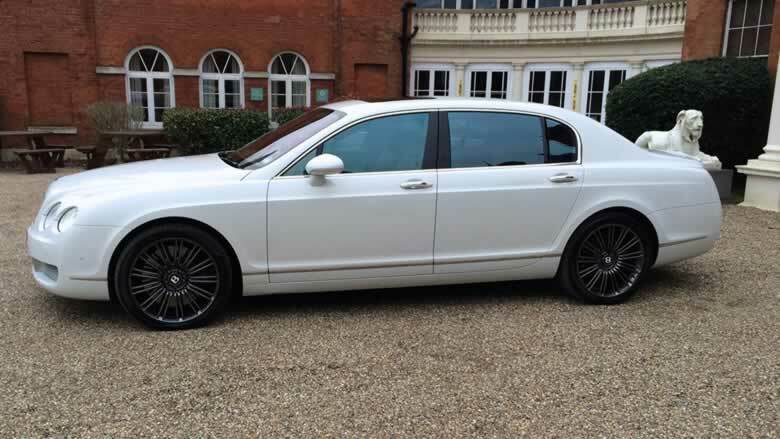 With such a rich heritage as one of the UK’s top automotive marques, we are proud to be able to offer this stunning white Bentley Flying Spur wedding car for wedding car hire in Essex, Hertfordshire and London. 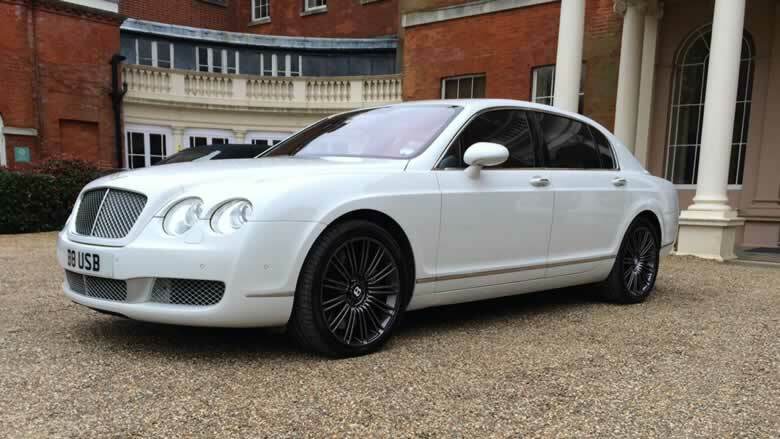 With its V12 engine, the Bentley Flying Spur is one of the fastest and most powerful cars on the road. This modern Bentley exudes style and luxury, making it a perfect choice as a special wedding car. With a beautifully styled exterior, sumptuous luxury leather interior, walnut veneer and room to accommodate the largest of wedding dresses, the Flying Spur is a wonderful modern wedding car with that celebrity touch. 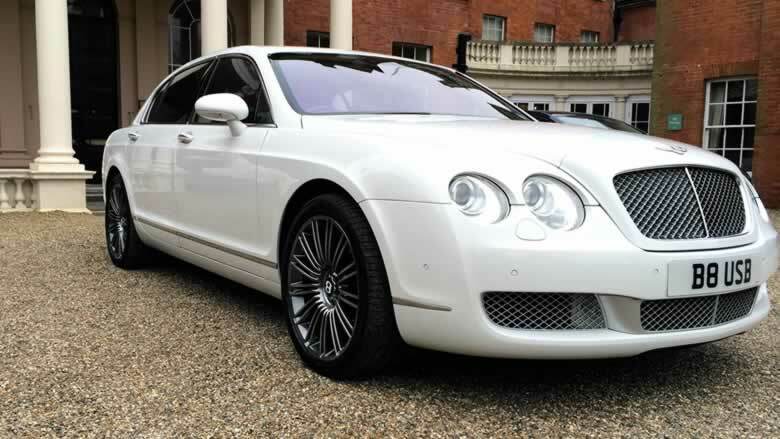 Embark on an unforgettable journey in our sumptuous and spacious Bentley Flying Spur. The Flying Spur is Bentley’s superb four-door saloon which is both spacious and extremely luxurious inside. Discover exquisite wood veneers and luscious creamy beige leather hides on the interior alongside numerous integrated technologies. 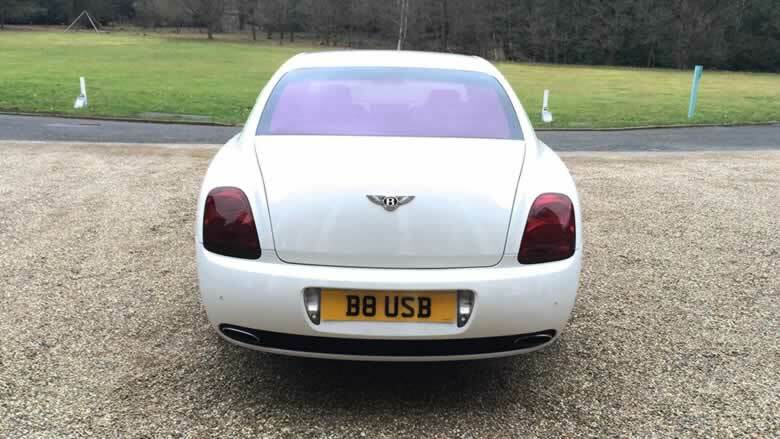 A great alternative to a Rolls Royce Phantom, our Bentley Flying Spur hire is a wedding car that is classy and stylish and sure to impress guests and bystanders as you arrive at the wedding venue. Our white Flying Spur will make any wedding day one to remember and cherish. Glamourous and romantic, the Bentley is a wonderful wedding carriage and an extravagant vehicle for that celebrity touch. 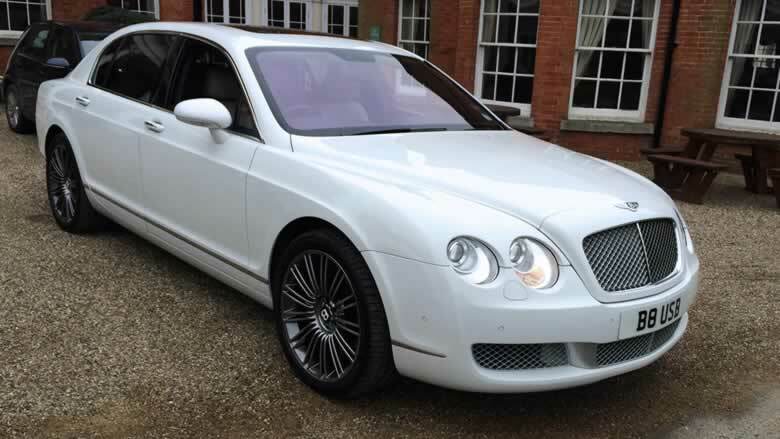 Our white Flying Spur will make any wedding day one to remember and cherish. Glamourous and romantic, the Bentley is a wonderful wedding carriage and an extravagant vehicle for that celebrity touch. 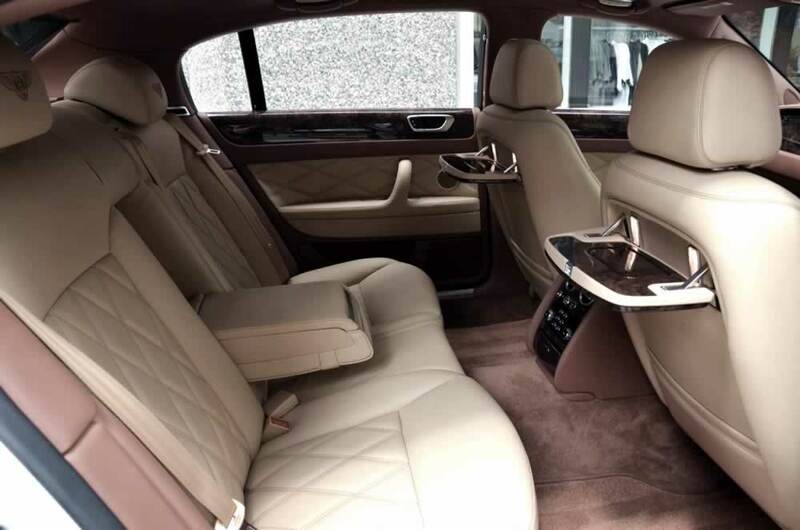 The spacious air-conditioned 4-door Bentley Flying Spur comfortably accommodates up to 4 passengers, excluding your personal chauffeur. The large boot in the Bentley Flying Spur can accommodate 3 large pieces of luggage or a mix of 1 or 2 large + 2 or 3 smaller luggage items or bags; making it the ideal choice for airport transfers. 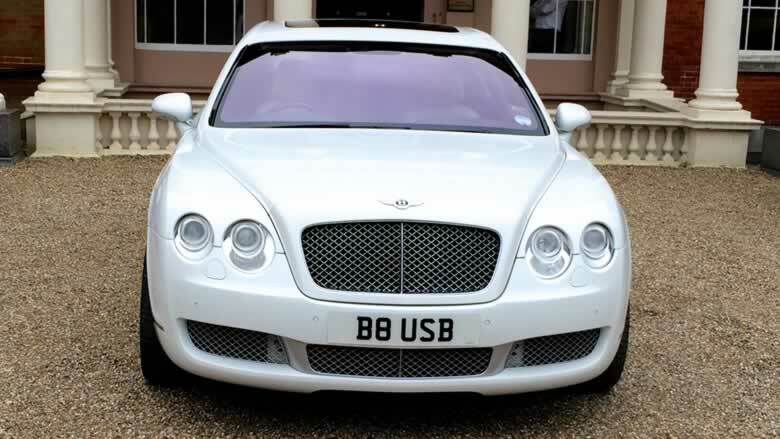 The Bentley Flying Spur is equipped with a ‘state-of-the-art’ digital in-car sound system. Passengers can also adjust the climate settings, seat heating, ventilation and infotainment features from both the front and rear. The spacious interior of the Bentley Flying Spur ensures that all occupants enjoy generous legroom, making it the perfect wedding day transportation for both Bride & Groom, to and from the wedding venue. Sip champagne as you travel in your Bentley Flying Spur wedding car, decorated with ribbons & flowers. 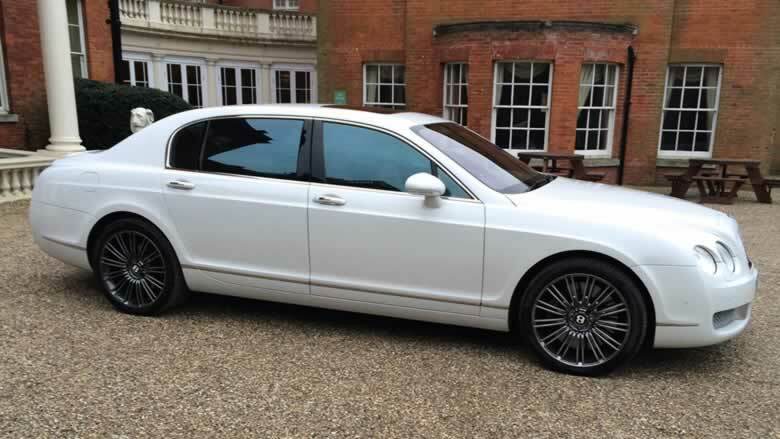 While the modern Bentley is a popular choice for a wedding car, we have a range of other excellent vehicles in our chauffeured cars fleet for you to choose from. 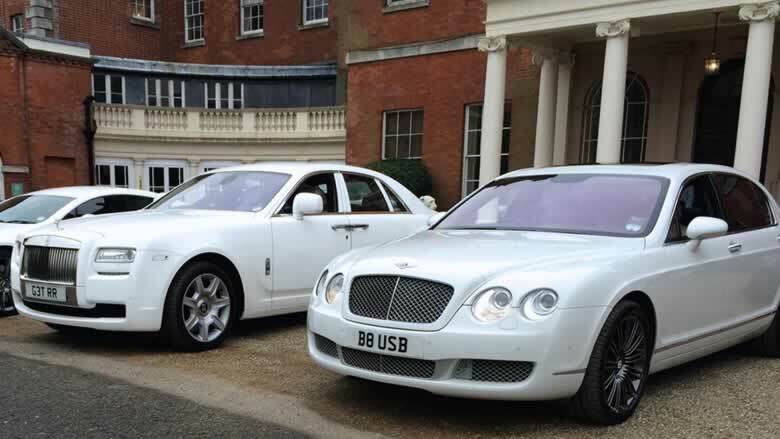 We can provide matching Bentley wedding cars for Bride & Groom, or coordinating cars of different Marques for the extended wedding party, offering superb value without compromising on style. The Rolls Royce Ghost is our newest Rolls Royce motor car; perfect for all occasion, be it business or pleasure, and especially as a white wedding car or for a special night out in London.